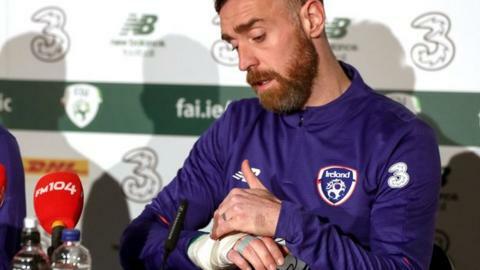 Richard Keogh has turned down surgery on his broken hand to be available for the Republic of Ireland's opening Euro 2020 qualifier away to Gibraltar. The Derby County defender suffered the injury against Stoke City last week, but is prepared to play in Saturday's qualifier in a lightweight cast. However, Shane Long has withdrawn from the squad with a groin injury. "I went for the X-ray and at first they were talking about surgery," explained 32-year-old Keogh. "This was before I spoke to the hand surgeon and I didn't particularly want to do that. "He saw the X-ray and said, 'I think we can do that'. If it hadn't been the middle of my finger where it's protected by the other two, I think I might have had to have surgery and been out for bit. "I had a good conversation with the hand surgeon, and he said he's seen this injury a few times and people have played with it." Saturday's match in Gibraltar will be the first of manager Mick McCarthy's second spell in charge of the Republic, who will host Georgia in Dublin three days later. He was dealt the news of striker Long's injury on Tuesday morning and has called Millwall forward Aiden O'Brien into the squad as his replacement. The Republic won just one of nine fixtures during 2018, a run which cost former boss Martin O'Neill his job, but one which Keogh is adamant the players have to take responsibility for. "The way it ended last year for us, it wasn't a great year, I think we can all hold our hands up to that," he added. "As players, we have got to take responsibility. We could have performed a lot better, but whatever has happened in the past is in the past now. "Mick's coming in, he's a fantastic manager and a fantastic guy. His record, not just for Ireland but at club level, is very good. "It's up to us now as players to really try to step up and have a really good qualifying campaign."